The main street of Castlemartyr from the west in the 1880s. The Fenians attacked from the other end of the street. The Constabulary Barracks was half-way down the street almost directly opposite the Market House. Later, the Royal Irish Constabulary moved into a new barracks closer to this end of the street, where they were attacked in 1920. The entrance to St Joseph’s Catholic Chapel is just behind the horse drawing the first car. Notice the small windows in the gables – an indicator of early to mid eighteenth century construction. Two buildings in Midleton have the same feature, suggesting that Midleton was originally a two storey town, just like Castlemartyr. On Friday evening, 31st March 2017, villagers and guests gathered at the village hall in Ballymacoda to be piped to the nearby church of St Peter in Chains where they comemorated the 150th anniversary of the death of Peter O’Neill Crowley, the local Fenian leader who was killed by Crown forces at Kilclooney Wood near Mitchelstown in north Cork – the last act of the Fenian Rising of 1867 in County Cork. The Fenian Brotherhood was an Irish revolutionary republican organisation founded by James Stephens in 1858. Stephens was a participant in the failed 1848 Young Ireland rising, after which he fled to Paris. Following his move to the United States in 1856, Stephens began to recruit conspirators amongst the large Irish community in the US. The outbreak of the American Civil War provided Stephens with the perfect recruiting ground for an immense recruiting campaign. The thousands of Irishmen and Irish-Americans who joined the Union army provided Stephens with an enormous and potentially valuable of trained and experienced soldiers for his organisation. To raise funds, the Fenians issued bonds to be redeemed when an Irish republic was established. However, very early on, tensions developed between the more hardline Amarican wing of the organisation which wanted a rising to be launched as soon as practicable in Ireland. The British reliance on slave-grown, and harvested, cotton from the Confederate states left an unwelcome odour in US political circles so that when the Fenians launched ‘invasions’ of British North America (Canada) in 1866, several US politicians didn’t feel it necessary to take drastic action against them. The Fenians also managed to recruit about 7,000 men in the British regiments based in Ireland. However, the Brotherhood had been thoroughly penetrated by British agents and the enormity of the Fenian recruitment of trained soldiers in the army appalled the government and prompted the authorities to start rotating regiments from Ireland. They also swooped on the Fenian leadership in Ireland in September 1866, effectively paralyzing the Irish command structure. Early in 1867 James Stephens was overthrown as leader in a coup within the Fenian Brotherhood and the new leaders settled on launching a rising on 5th March – Shrove Tuesday. Killmallock Barracks, County Limerick, following the Fenian attack in 1867. The Constables and their wives defended it against a large force of Fenians. The night of 5th March was also known as Skellig Night in Munster – it was, effectively, an Irish Carnival, although the puritanically minded Catholic Church tried to discourage such folk festivities. In Midleton, people ‘knocked about’ – that is they made merry and created harmless if noisy mayhem in their last opportunity to let their hair down before Lent began next morning. On Skellig Night, the night of Shrove Tuesday, 5th March 1867, four constables, Greany, O’Brien, O’Donnell and Sheedy, left the police barracks on Main Street, Midleton, to patrol the town. They turned north to eventually patrol the Cork Road. They then returned to the Barracks to consult the Head Constable. Oddly, it was on the Cork Road that a carpenter called Timothy Daly assembled his force of somewhere between thirty and forty men, armed with a few guns, pikes and agricultural tools. It is not entirely known how the two groups of men managed to avoid each other but it seems likely that the Midleton Fenians assembled when the coast was clear, a likely event if they had monitored the regular patrols from the barracks. The Fenians marked in military formation carrying sloped arms down the lenght of Main Street. Twice in the darkness the Fenians were approached by townspeople and asked who they were – one man thought that they were a large police patrol. (It should be noted that the Midleton Gas Company had been established 1859, but it is not certain how many public gas lights there were on Main Street at the time.} The Fenians marched to the southern end of Main Street and reassembled their men at Lewis Bridge where they redressed their ranks by the National Bank. This is where the four constables encountered them having resumed their patrol from the police barracks. The Fenians trapped the police within a semi-circle, with the wall and high wooden gates of Mr Green’s house behind the constables. The former National Bank at the Rock in Midleton was where the Fenians assembled to confront the patrol of four constables. The encounter left constables wounded – Patrick Sheedy soon died of his wounds. The Fenians challenged the police in the ‘Name of the Irish Republic’ to surrender and give up their arms. Tim Daly reached for Sub-Constable O’Donnell’s gun and as the two men struggled over the gun, a shot rang out and Sub-Constable Patrick Sheedy fell mortally wounded. Next, Constable O’Donnell was shot in the head but only lightly wounded. The other two constables fled, in opposite directions as a fusillade rang out. Witness to murder: the occupants of these houses would have witnessed the Fenians shooting Constables O’Donnell and Sheedy. Note the date of construction made out in yellow brick on the right – 1861. The Fenians then stripped the fallen constables of their arms and munitions, and then in marched up Chapel Road towards Ballinacurra. From Ballinacurra they took the Gereagh Road to Ladysbridge. That village is the meeting point of five roads, so it was the assembly point for groups from Aghada, Cloyne and other places in the district. AS the events in Midleton were taking place Peter O’Neill Crowley led the Ballimacoda Fenians in a raid on the Coastguard Station in Knockadoon. Nobody was hurt in the raid but the entire stock of guns and ammunition was removed from the Coastguard Station. Taking the coastguard men as prisoners, the Fenians then marched via Killeagh to Mogeely where the prisoners were released. The Fenians then moved north of Mogeely to Bilberry Hill to await the other groups from Midleton and elsewhere. The coastguard station at Ring, Knockadoon. There si some question as to whether this structure is the one attacked by the Fenians on 5th March 1867 or a replacement. Evidence of fortification suggests that is dates from AFTER the Fenian raid – landowners once again began to build ‘fortified’ houses after 1867! Captain John McClure, leading the combined force from Ladysbridge, assembled his his men at the crossroads on the eastern side of Castlemartyr, across the river from the Main Street. He then proceeded up the street to call on the constables to open up and surrender, but they refused. Calling for volunteers, McClure ordered Tim Daly and his men to attack the barracks. A gunfight ensued, waking some of the villagers who opened their windows to see what was up. The Fenians ordered them to shut their windows and stay indoors, while the attack was continuing. The six constables in the barracks, trained and well armed, were able to hold off the Fenians, and one constable, firing from a side window, shot Tim Daly. The wounded man managed to move ten perches (fifty metres) from where he was shot, and he died partially on the pavement and partially on the roadway – almost exactly the same as Sub-Constable Sheedy in Midleton, as was noted at the Coronor’s inquest into Sheedy’s death. Daly laft a wife and eight children. The original Constabulary Barracks in Castlemartyr was apparently in this building which later became one of the best known motor garages in East Cork when the Constabulary were moved to another building in Castlmartyr.. When the Fenians retreated back across Castlemartyr bridge the Head Constable O’Connell led his men out to clear their attackers off. However, when they got to the bridge the realized how many men opposed them and retreated to the security of the barracks. It was later claimed that the Fenians had barricaded the bridge, but there was never any evidence for this. The police probably thought that discretion was the better part of valour. The narrow side window from which Tim Daly was apparently shot can be clearly seen in this image. It was an excellent building from which to control the main street of Castlemartyr. Captain McClure then led the main body of his force to Killeagh from where they vanished – supposedly in the direction of Tallow in County Waterford. In fact many of them almost certainly ended up in Kilclooney Wood between Mitchelstown and Kilmallock. The next morning saw a train arrive at Mogeely railway halt from Youghal to disgorge companies of the 67th Regiment to take control of Castlemartyr. Peter O’Neill-Crowley and his men, waiting patiently but surely forlornly at Bilberry Hill, spotted this and realised that the rising must have failed. Some time later another train arrived – from Cork. This disgorged Companies of the 14th Regiment who replaced the 16th Regiment in Castlemartyr, while the rest of the 14th Regiment occupied Midleton. The Market House tin Midleton was pressed into service as a temporary army base. A number of men were arrested in Midleton and Castlemartyr and rapidly hauled before the magistrates to await trial for treason before a special commission that was established almost immediately. The Market House in Midleton (now the library) was used as a base by the 14th Regiment the day after the failed Fenian rising. Meanwhile various groups of Fenians gathered at Kilclooney Wood. It was there on 31st March that a force of police and soldiers found and attacked them . One man was shot – Peter O’Neill Crowley from Ballymacoda. He was gravely wounded and taken immediately to Mitchelstown where here died some hours later. His funeral a few days later was one of the biggest in County Cork. O’Neill Crowley’s body was carried on the shoulders of supporters all the way from Mitchelstown to Ballymacoda (a distance of about sixty MILES)! The irony of the whole incident was that one of the leaders of the Crown forces was Edward Redmond, the Resident Magistrate in Lismore, and uncle of John Redmond, the leader of the Irish Parliamentary Party who eventually obtained the passage of Home Rule Act of 1914, and of Willie Redmond who died on the Western Front during the Great War. In early April, the Lord Lieutenant of County Cork, Lord Fermoy, who lived at Trabolgan, summoned a meeting of the magistrates of Imokilly to meet at Midleton Courthouse to discuss the rising and to express their support for, and admiration of ,the work of the police in suppressing the rising. Constable O’Connell was highly commended for his actions in Castlemartyr, and condolences were expressed to Constable Sheedy’s widow. Manning Tower, a Napoleonic era martello tower, located between Fota and Great Island, was attacked and raided, with nobody being hurt, in December 1867. This was the only martello tower ever ‘taken’ by an enemy and the raid led to the closure of martello towers as military installations in 1868. In September, the rescue of two Fenian prisoners from a police van in Manchester led to the accidental death of a police sergeant and the subsequent manhunt eventually resulted in the capture of five men, of whom three were later tried for murder. the Three men were found guilty of murder, despite the flimsy evidence. They were condemned to hang. The men were Philip Allen, Michael Larkin, and Michael O’Brien. who was born in Ightermurrogh, between Ladysbridge and Ballymacoda. O’Brien’s childhood home has long been demolished. This probably happened not long after his father, John O’Brien, was evicted from his farm by the Earl of Shannon despite being fully paid up in all his rents and any arrears. Michael O’Brien had fought in the American Civil War and was an American citizen. The final act of the Fenian year in Cork came in December when ‘Captain Mackey’ (as pseudonym for a man called Lomasney) managed to raid Maiining Tower, the martello tower situated between Fota and Great Island. Mannin Tower was the only martello tower in Britain or Ireland to be successfully ‘attacked’ and ‘taken’ by an enemy force. This led, in early 1868, to the decommissioning of all martello towers in Britain and Ireland. The Fenian Rising of 1867 was suppressed by the police – the military forces were hardly involved, except to secure ‘infected’ areas following the uprising. This was why Queen Victoria granted permission for the Irish Constabulary to be renamed the Royal Irish Constabulary (RIC) in September 1867. One question must be asked: did the Fenians use ‘Skellig Night’ revels as a cover for assembling their forces? Bold Fenian Men – a lecture to commemorate the 150th anniversary of the Fenian Rising in East Cork. A view to a killing: Rock Terrace, Midleton, was built in 1861 – a mere six years before the Fenians under Timothy Daly shot dead Sub-Constable Sheedy and injured Sub-Constable O’Donnell across the street at the entrance to Mr Green’s house. Note the date of construction made out in yellow brick on the right of the photograph. A hundred and fifty years ago this month (Tuesday 5th and Wednesday 6th March 1867) the Fenian Rising took place in various parts of Ireland. 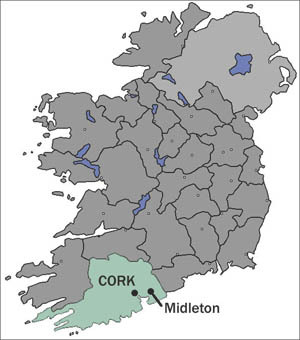 A major series of incidents happened in Knockadoon, Midleton and Castlemartyr. No official ceremonies have been arranged but on Saturday 18th March, there will be a lecture on the subject in Midleton Library. Appropriately the library is housed in the old Market House.which was used to house troops from the 14th Regiment in the aftermath of the Rising. The lecture will take place on Saturday 18th March at 12.00 noon in Midleton Library. Admission is free and all are welcome! The 1867 Fenian Rising in Midleton, 5th and 6th March – 150 years ago this month. Mistakenly called ‘The Fenian Man’ this statue actually commemorates the birth of Irish republicanism in the United Irishmen’s rebellions of 1798 – nearly seventy years BEFORE the 1867 Fenian Rising. However, the Fenian rebels who marched from Midleton to Castlemartyr did assemble at the Fair Green beyond the trees in the background. In front of the Courthouse in Midleton there stands a recently erected life-sized bronze figure of a man holding a pike. The popular local name for this figure is ‘The Fenian Man‘. Unfortunately the name is a misnomer. The figure actually represents a participant in 1798 rebellion of the United Irishmen – almost seven decades before the Fenian Rising. Many people in Midleton do not realise that the housing scheme called Tim Daly Terrace is actually the town’s real monument to Midleton’s role in the 1867 Fenian Rising. The Fenian Rising is usually associated with other parts of the country , such as Tallaght in County Dublin and Kilmallock in County Limerick. Yet, on the evening of March 5th 1867 about fifty men led by Tim Daly assembled at the Fair Green in Midleton to march ‘in military order‘ to Castlemartyr where they planned to attack the Constabulary barracks there Two police constables were shot at the Rock, Midleton, one, Sub-Constable Sheedy, being fatally wounded. The column continued to Castlemartyr via Ballinacurra and Ladysbridge, attracting further groups on the way. The attack on Castlemartyr police barracks was fought off by the police, but it led to Tim Daly’s death. Daly left a wife and eight children. Sub-Constable Sheedy left a wife and seven children. One of the ironies of Midleton’s involvement in the Fenian Rising is that almost exactly a month later the Christian Brothers opened their school in Midleton. The nationalist republican interpretation of Irish history is often called ‘the Christian Brothers’ version’ of Irish history. The present author’s personal experience of studying history at the same CBS Secondary School in the early 1980s is worth noting – Midleton (and East Cork’s) role in the Fenian Rising was entirely ignored!